It's one of those weeks where a LOT is going on. Eco-speaking, that is. You've got World Water Day this Friday, March 22nd, and Earth Hour, this Saturday night, March 23, 8:30--9:30. If you've been following along here at GTG, you already know a bit about World Water Day through Part 1, Part 2, and my all time favorite video (a blast from the past). But, unless you've been here for years, you might be questioning, "What is Earth Hour?" Well, as you can imagine, I've already had a lot to say on that here at GTG (so check my archives). But, lucky for you, I'm no where near done. Via Empowerment and Activism: Earth Hour takes on a life and energy of its own--I love taking part in it. I love energizing kids about it each year as we watch the videos, brainstorm about it, and write persuasive paragraphs about it. The kids can even see that by turning off your lights from 8:30 to 9:30 pm your time zone, you are a part of something big. That truly is the definition of awe-inspiring! This year we'll be at a school sponsored event, where due to the logistics, our time is lessened, which is a bit of a bummer, but still you are one who is small, taking part in one something that is globally big. Watch the Official Earth Hour 2013 video and feel the need to be a part of something big...a part of something global!! Then turn out your lights this Saturday from 8:30 to 9:30 in your time zone and watch the "wave" of "de-illumination" take place!! 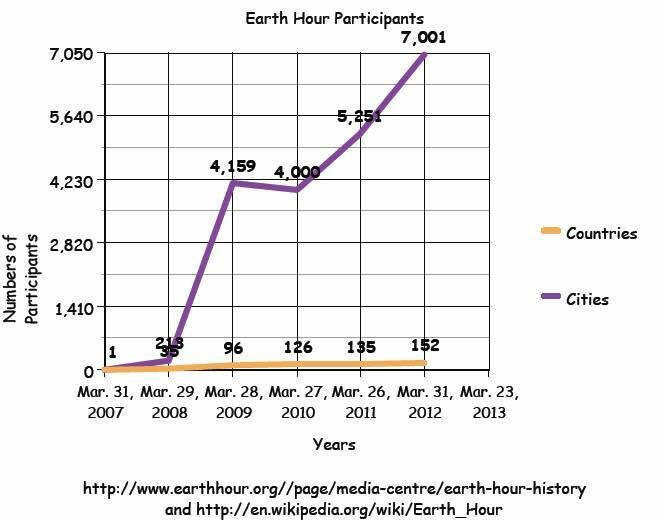 Video and header from www.earthhour.org; graph created using Earth Hour Statistics (from their website) as created on the Create A Graph Website.